The trend of good fishing continues once again with multiple trips this past week producing some nice chinook and prawns. For the most part, the fishing has been very consistent, with only this past Saturday being a little slow for some reason. That didn’t last long though, as on Sunday the fish were back on the bite and we were landing nice chinook into the low teens. 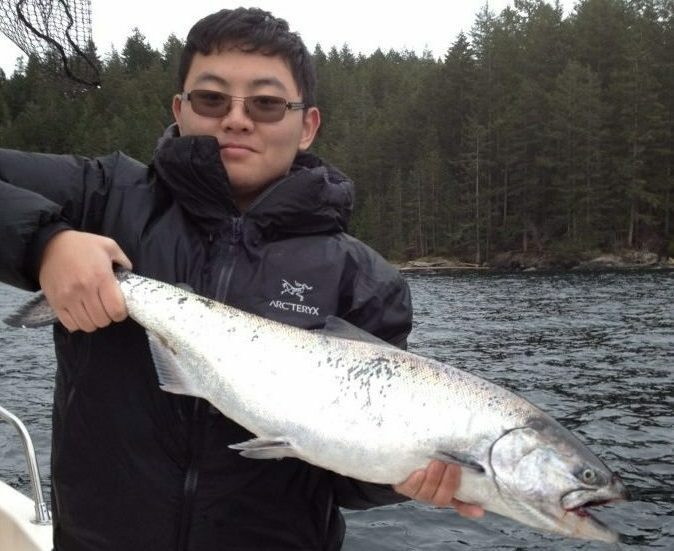 The fishing has been good both in Howe Sound and Vancouver Harbour. That has given us plenty of options on both the flood and ebb tide or if it there is too much wind in Howe Sound. These winter chinook move around a lot, so it should be no surprise the fish are spread out over multiple locations. On one trip this week we hit fish in Howe Sound and then tried some spots in Vancouver Harbour on the way home and hit fish there as well. As our regular report readers know, keeping your gear close to the bottom is critical for catching these fish. Troll a little on the faster side, so at least a 45 degree angle in your downrigger cable. This will allow you to cover more ground and these fish are aggressive so a faster presentation works well. Although you can use bait, we prefer to use spoons and flashers. Some of our top producing flashers this week have been the Salty Dawg, Green Onion Glow, and Chartreuse Glow. We have been using 5 to 6 foot leaders to spoons in the 3.5 to 4.0 size. There are so many good spoons on the market today, but some of our favorites are the Pesca and Kingfisher. There are quite a few good colours to choose from but it seems the ones with some green, chartreuse, and glow on them have been the most productive these past 2 months. We have a great selection of flashers and spoons for winter chinook at the shop, so if you want to get dialed in on the right gear, come down and take a look. If you are interested in booking a charter, now is the time. The fishing is good and we also have a special promotion right now for our 8 hour trips. To reserve your date give Luis a call at 778-788-8582.